The Sandwich Plate System (SPS) is a composite material of two metal plates bonded together with a polyurethane core. It is a proprietary product marketed by IE-SPS and used in the civil engineering, maritime, offshore, and military fields. The SPS bridge deck has received awards (see example) and was recently selected by the AASHTO Innovation Initiative (AII) for accelerated adoption by agencies nationwide. 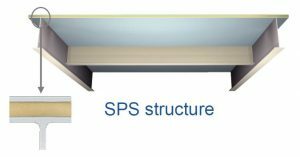 SPS delivers a high stiffness-to-weight ratio, simple fabrication, improved performance for structures and increased safety. It allows the elimination of stiffeners and prevents buckling. SPS elements are custom designed to meet the needs of each specific application. More than 12,000 tests have been done on SPS to confirm and establish its performance advantages. SPS has 507 patents issued worldwide with another 170+ patents pending.